Then, in Vraja, after five days, in the month of Bhādra (August-September), on the sixth day of the bright fortnight, when Mercury, five exalted planets, and the constellation Libra were on the horizon, at midday, as the demigods showered a beautiful rain of flowers and the clouds sprinkled drops of water, the Supreme Personality of Godhead, illuminating Nanda’s home with His splendor, was born from Vasudeva’s wife (Rohiṇī). 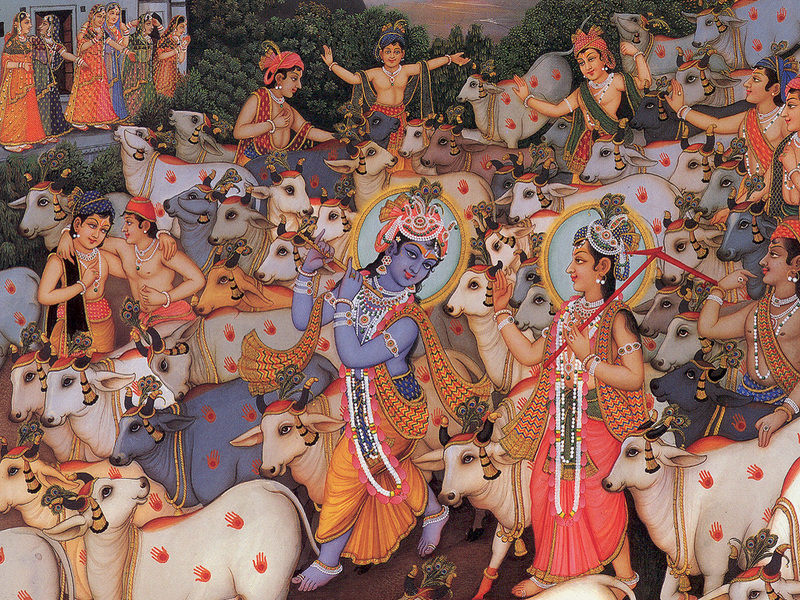 Nanda performed the child’s birth ceremony and gave in charity a million cows to the brāhmaṇas. Then he called the gopas and observed a very auspicious festival with the music of many singers and instrumentalists. Coming there with Devala, Devarāta, Vaśiṣṭha, Bṛhaspati, and myself (Nārada), Vyāsadeva was pleased when Nanda washed his feet and worshiped Him in many ways. 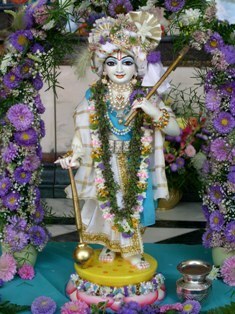 Śrī Nanda said: Who is this handsome boy, whose equal cannot be seen anywhere? How is it He was born after only five days (in the womb)? O great sage, please tell me. Śrī Vyāsa said: Nanda, you are very fortunate. This child is eternal Ananta Śeṣa. In Mathurā City He was conceived by Vasudeva in Devakī. By Lord Kṛṣṇa’s wish He was brought to beautiful Devakī. O King Nanda, you may see Him even though the great yogīs cannot. I, Vedavyāsa, have come here to see Him. Therefore, please show Him, the Supreme Person who is greater than the greatest and who now displays the form of an infant, to us. Śrī Nārada said: Then Nanda showed them the child Aannta Śeṣa. Gazing at the child in the cradle, Vyāsa, struck with wonder, bowed down, and spoke. Śrī Vyāsa said: O master of the demigods, O Supreme Personality of Godhead, O Lord who grants desires, obeisances to You! Obeisances to You, who are Lord Aananta Śeṣa! 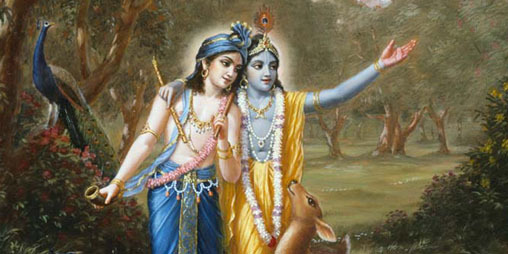 Obeisances to You, who are directly Lord Rāma! Eternal obeisances to You, Lord Saṅkarṣaṇa, the maintainer of the earth, perfect and complete, effulgent and glorious, holding a plow in Your hand, and having a thousand heads! You are Baladeva, Revatī’s husband and the infallible Supreme Personality of Godhead’s elder brother. You are armed with a plow. You are Pralambāsura’s killer. O Supreme Person, please save me! Obeisances! 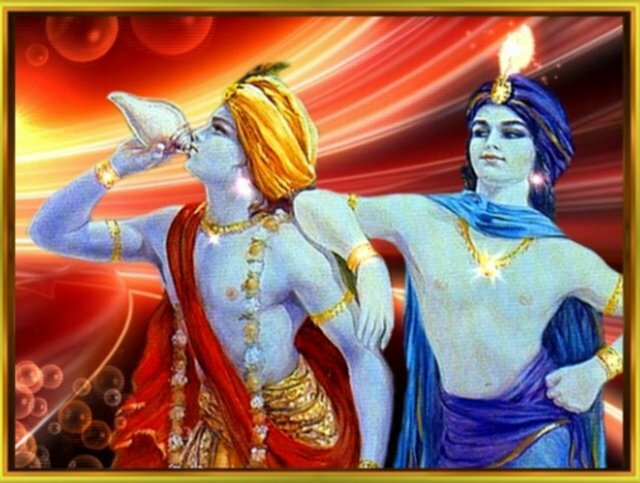 Obeisances to You, who are known as Bala and Balabhadra, and who carry a palm-tree flag! Obeisances to You, Rohiṇī’s fair-complexioned son dressed in blue garments! You are the enemy of Dhenuka, Muṣtika, Kūṭa, Rukmī, Kūpakarṇa, and Kumbhaṇḍa. You put an end to Balvala. You divided the Yamunā and dragged Hastināpura. You are the enemy of Dvivida. You are the king of the Yādavas and the decoration of the circle of Vraja. You are the killer of Kaṁsa’s brothers, a pilgrim who goes to holy places, the Supreme Master, and the teacher of Duryodhana. O Lord, please protect, please protect the world! O infallble Lord, O greater than the greatest, O Lord Ananta, O Lord whose fame is everywhere, glory, glory to You! Obeisances to You, who hold a plow and a club and are the master of the demigods, great sages, and regal serpents! A person who regularly reads or recites these prayers attains Lord Hari’s supreme abode. Even in this world he attains all strength. He crushes his enemies. For him are victory, wealth, and followers. Śrī Nārada said: After circumambulating Lord Balarāma and bowing down before Him a hundred times in the company of (the other sages), intelligent Vyāsa Muni, who was the son of Parāśara and Satyavatī, went to the Sarasvatī river.